Lawn Chairs, Picnic Coolers, Blankets? Can I see the brewer and beer list or Official Program? What happens if the weather is not favorable? What is the Great Taste of the Midwest? To our knowledge, the Great Taste is the second longest-running craft beer festival in North America. Every year over 190 breweries and brewpubs serve about 1400 different beers in a beautiful lakeside setting in Madison, Wisconsin. The brewers themselves usually to attend and pour, so you have a chance to talk to the people who brewed the beer, rather than someone who may not know what he or she is serving. The Great Taste of the Midwest beer festival is held annually at Olin Park in Madison on the second Saturday in August. 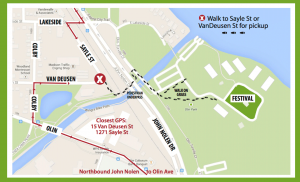 The festival site is just off John Nolen Drive, across from the Alliant Energy Center. The gates open at 1:00 p.m. and the event ends at 6:00 p.m. There are NO onsite ticket sales. There will approximately 1400 beers this year. Your ticket price includes unlimited sampling in a beautiful commemorative tasting glass between 3 and 6 ounces and an informative program book to guide you toward the brewers and beers on site. The ticket price for the 2018 Great Taste of the Midwest is $60. Unlike many beer events, we’re not out to make a buck. The Madison Homebrewers and Tasters Guild is a nonprofit group – a homebrewing club, in fact! We do it for the love of beer, to educate others about beer, and to celebrate our good fortune of having some of the finest brewers in the world right here in the Midwest. Also, we support other good causes (other than beer education). Proceeds from the event benefit WORT 89.9FM, a community radio station in Madison, and many other local groups and charities. Please read our Tickets page carefully for all of the details. The 2018 Great Taste will quickly sell out in May and there are NO onsite ticket sales. Where can I find a room near the festival? See our Lodging information page for a list of nearby hotels. Some are within easy walking distance and others near shuttle locations. Some hotels even run their own shuttle to Olin Park. If you can’t find a room within walking distance, be sure to have a designated driver or take a cab or shuttle bus to and from the event. Local brewpubs will offer shuttle service again this year. Some people camp in nearby county or state parks. What about parking at the festival? There is absolutely no patron parking at Olin Park. There will be no patron vehicular access to the frontage road within the park, which will be a designated tow away zone. We have a designated drop-off area along Sayle St and Van Deusen St.
Olin Park will be off limits to all non-event vehicles this year, which includes drop offs before and pick-ups after the event. If you have a designated driver or are using a rideshare service (Uber, Lyft, etc) who will be transporting you in either direction, you will need to take notice of this. We’re asking everyone to respect this as it will be enforced by the Madison Police Department. Please see the drop-off/pickup section of our travel page for more information. Many of our local breweries and bars sponsor shuttles to the festival. Please see our Shuttles page for more information. Do Madison’s city buses stop at the festival? Madison Metro bus route #13 stops near Olin Park. There’s a Coliseum stop on John Nolen Drive, across the road from the park entrance. The fare is $2.00 each way, or you can purchase a One-Day Pass for $4.50 which is good for an unlimited number of rides per day. Two adults can ride all day for $6 total by requesting a 2-4-6 pass on the weekends. Can I catch a cab from the fest? Union Cab, the official taxi cab company of the Great Taste of the Midwest, will be there in full force, with easy pickups and deliveries inside the park at the south parking lot. Union Cab rides to your home or lodging site are only $1. This rate is heavily subsidized by MHTG, please tip your driver generously! All other taxi companies that pickup and deliver will charge full fares. Of course! Plenty of foods will be available, from small snacks to bigger meals — for both carnivores and vegetarians. Stop by the food vendor tents and have some of Madison’s tastiest treats. The festival grounds are quite large. Many people bring blankets or lawn chairs and set up their own tasting lounges on the outskirts of the festival grounds, away from the hubbub of the beer tents. Please be considerate and keep your chairs and blankets out of the middle of the festival grounds so as not to obstruct traffic flow between the beer tents. There are oak savannah restoration areas that are roped off and we ask you to help us care for this beautiful park by respecting those boundaries. Can I bring my own beer to share? There will be plenty of beer to sample so there’s no need to bring more. Seriously though, bringing beer would violate our permit so please don’t do it. If you want to share or trade beer, please do so outside of our event. You can download programs on our at Program information page. In an effort to posting the most accurate information possible, the event program is typically not available until early August and usually not until the Wednesday preceding the Great Taste, so please check back often. We offer both iPhone and Android apps that can be downloaded for free onto your mobile iOS and Android devices. The apps contain the same brewery and beer lists as the program, but have additional features, as well. All last second brewery and beer list changes are updated after the program has gone to print —so the apps will be even more accurate! As with the program, the current version is not available until early August and usually not until the Wednesday preceding the Great Taste. Designated driver tickets are $10 and available when and where you purchase your sampling ticket, whether in-person or by mail order. By law, dogs are NOT permitted in most city parks, including Olin Park. The Great Taste would be a challenging environment for a well-behaved dog in any case. By law, children are permitted in most city parks, including Olin Park. ? Children under 16 are admitted to the festival for free. Since this IS Wisconsin, children whose attending parents wish their children to sample beer must pay the full admission price. Parents of consuming children cannot allow their children to ask for pours. The parent must hand the minor the drink and must remain with the minor at all times. No exceptions! Though we’re being pressured by beer enthusiasts everywhere to disallow smoking, it is still permissible. However, possession of lit cigarettes, cigars, and pipes inside our tents is prohibited by the Madison Fire Department. Don’t abuse the privilege by smoking inside our beer tents. Please be considerate and confine your smoking to the outer regions of the festival grounds or risk losing the privilege in future years. Most importantly, please respect this beautiful park by disposing of your cigarette butts appropriately. There’ll be wandering minstrels throughout the afternoon too. All musicians play UN-amplified. This is a beer tasting festival with music, not a music festival with beer. There will be a variety of musical styles to complement the incredible variety of beer styles. We’ll have exhibits by a variety of brewing industry affiliates, regional beeriodicals, and beer ingredient providers. You just might learn something at the Vendor Mall. There’ll be beer glass sales, commemorative T-shirt sales, and more fun than you can shake a stick at. All sales at the festival are cash only — no checks or credit cards. Brewers often bring items from their brewery that are offered for sale, as well. The Great Taste is held rain or shine. Please dress appropriately. The fest will NOT be canceled nor rescheduled. If you lose something at the festival, please ask one of the organizers to direct you to the club tent where the lost and found is located. After the festival, you can contact [email protected] with a description of your item to see if it was found. Fair warning that during the couple of days leading up to the festival, we will not be checking email as frequently and may not have a chance to reply before the festival.